In their eight active years, Los Angeles based experimental noise-rock sextet Slug recorded three albums, a half-dozen singles, and tracks on several compilations, and played hundreds of shows in Los Angeles, the northwest and throughout the US. They played alongside bands including Unsane, The Jesus Lizard, Fugazi, Jon Spencer Blues Explosion, Hole, Ruins, Distorted Pony, Cherubs, Steel Pole Bathtub, Sleep, Unwound, Crash Worship, Nation of Ulysses, KK Null, and many others. 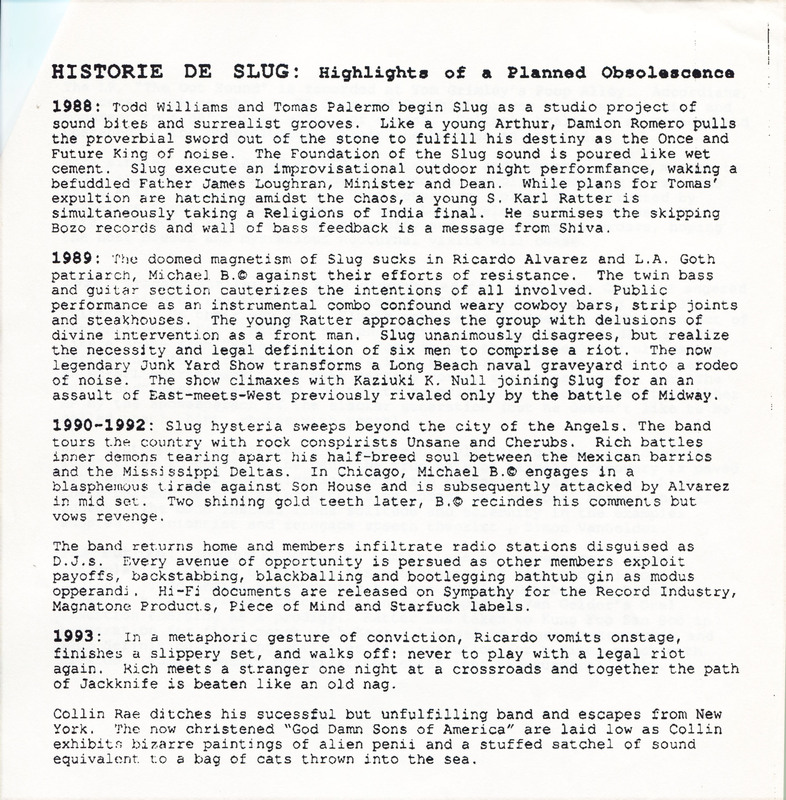 Throughout their career, the members of Slug were active in the Los Angeles music scene, as DJs on KXLU radio, working on side projects, and running their own record label Magnatone Products. Slug also enjoyed the distinction of playing the most shows at the influential, all-ages club Jabberjaw during it’s brief, incandescent lifespan. The band’s line-up always included two guitars, two bassists and a variety of metal percussion, tape loops, and found instruments. The band toured nationally twice and played it’s final show in LA in 1996 at a now-defunct Hollywood record store, No Life. 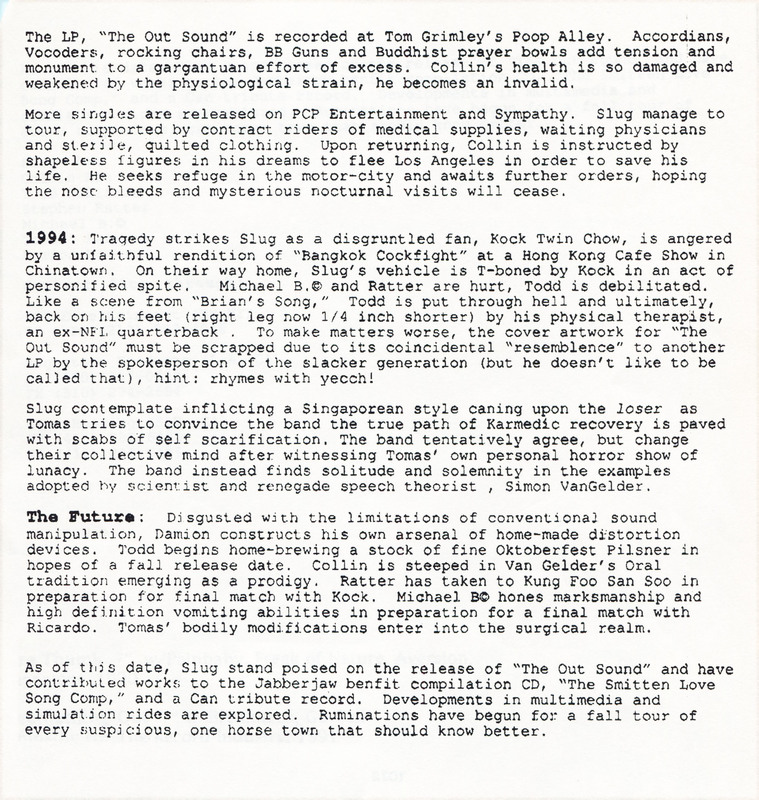 You can also read more about the history of Slug at Trouser Press.